Discussions Magazine Music Blog: SHARON JONES: An EXCLUSIVE interview! SHARON JONES: An EXCLUSIVE interview! Sometimes words completely fail to describe emotion. Trying to express ‘feeling’ through a computer keyboard becomes utterly pointless. I could go on and on about Sharon Jones & The Dap-Kings’ moving and powerful records, but why? My excitement simply won’t translate over your cell phone screen, or between bites of your fine lunch-time pastrami sandwich. I can only convince you to experience her music for yourself. I have no doubt you will melt the moment you hear the passionate, sweaty and life-affirming Soul of Sharon & Co. Every glowing review is true—mix Ike & Tina Turner’s soulful Rock with the heavenly power of Aretha Franklin and you’ve got Sharon Jones. Since she began working with Daptone Records in 2001, she’s released nothing but pure gold. She may have had to wait until she was in her 40s before being ‘discovered’, but we can all be glad to now get the chance to bask in her glow. Thank the deity of your choice for that! A phone conversation with Sharon is hard to describe. She’s as down-to-earth and friendly as you can imagine. She also tends to break into song mid-sentence – a touching experience since I alone was her sole audience member at that moment! Above all else, her excitement for the 2015 release IT’S A HOLIDAY SOUL PARTY shone through. Sharon is truly electrifying, whether she’s speaking or singing. Despite her graciousness and kindness, I was still in awe. Our exchange was even more special because I’m such a fan of Christmas music. So here we were, discussing a band I love and a musical genre I love all in one conversation! IT’S A HOLIDAY SOUL PARTY avoids all the Christmas music clichés (apart from some sleigh bells here or there) and hits you right upside the head with Soul, Funk and power. Sharon’s Gospel-infused performance contains all the fire you’ll need to warm yourself come winter time. Like a mixture of early Tina Turner and James Brown, this sip of the holiday season will keep you coming back for more. STEPHEN SPAZ SCHNEE: IT’S A HOLIDAY SOUL PARTY is now available. How are you feeling about how it turned out? 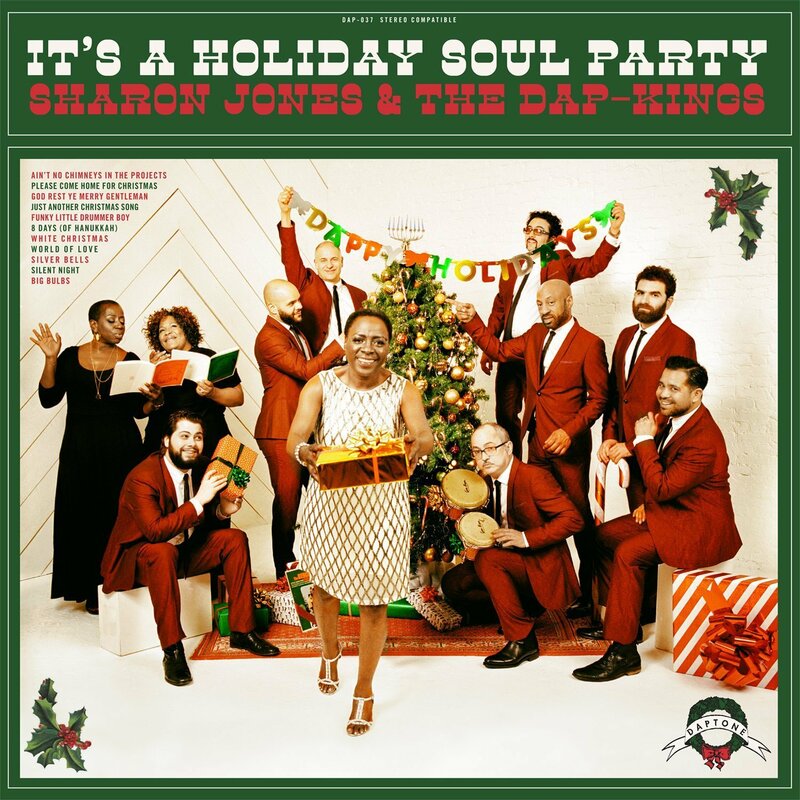 SHARON JONES: I was listening to it for the first time since we finished making it and I just couldn’t wait for it to come out! SPAZ: What inspired you to make it a “holiday” album as opposed to a straight Christmas album? SHARON: We’ve wanted to do a Christmas album for years but we never got around to it. Finally, I just jumped on the piano and said, “I’d like to do ‘Silent Night’ like this,” so the guys followed me. A lot of the ideas and arranging – that’s how I felt things and they just followed me on that. “Please Come Home For Christmas” – that’s one that my mother used to play when I was a little girl. I think we went through five copies of that through the years. That’s always been a song that’s been on my mind for me to do. For “Silver Bells,” I just felt that Gospel vibe. A lot of the stuff, we tried to give it that Ike & Tina Turner R&B/Rock ‘n’ Roll feel. That was in my head and we just went for it. It was so easy. SPAZ: Apart from the lyrics, did you approach the album with a different mindset than how you’d record a normal Sharon Jones record? SHARON: A lot of the time, we get in, get the music playing and we sit and we listen. But this time, I just went in and jumped on the piano and said, “What about something like this?” and we all went right into it. SPAZ: What did you do to get in the holiday spirit for the recordings? SHARON: You know how it went with us? We had time (to record)! (Laughs) We had time off and we got everyone together and said, “Let’s do this right now! We’ve got two weeks.” And that’s how we did it. It’s hard when you’re off the road and you want to get everyone together. Once we know we have downtime, everybody plans things with their families or whatever. So, when we had a break, we had to set aside a certain amount of days to get this Christmas album done. That’s what we did. You have to do that or it will never get done. SPAZ: Did you have a clear idea of what you wanted to do and how you wanted things to sound before you started recording? SHARON: We just do what we do. Whenever The Dap-Kings and I get together, we feed off each other. That’s how we do things. SPAZ: Gospel informs both Soul and Christmas music. Have you ever thought about recording a straight-ahead Gospel album before? SHARON: Oh, yeah. That’s coming up next. I like Gospel music but I love the old classics. I’m not too much into that new contemporary stuff. I like Mahalia Jackson and Shirley Caesar – I’ll probably do stuff like that. We’ll arrange them and add horns. The Dap-Kings will be the backing band. It will have a soulful vibe to it – kind of Ray Charles-ish or Sam Cooke-ish. I’m quite sure some of the guys will write something or rearrange other things. I’ll pick a few Gospel classics that I want to do and we’ll work with it. SPAZ: What are some of your personal holiday favorites? SPAZ: A friend of mine recently introduced me to Ella Fitzgerald’s version of “The First Noel” and now I can’t listen to any other version without comparing it to that one! SHARON: Yeah, that’s what you do – you find YOUR favorite versions. A lot of the newer Pop stuff that came out in the ‘90s and early 2000s, there’s nothing new or different. You’ve got to be a little more creative. SPAZ: Apart from the Gospel album, what’s next for Sharon Jones? SHARON: I would love to get into voice overs! I would love to be a character in cartoons. I want to continue what I’m doing, but I’d love to get into some other things. I’m getting older. I love touring and we can always go out and do things. But I might want to try something with a little more spice. Maybe get into acting – hopefully Tyler Perry might come around and find something for me to do! (Laughs) I would love to get on some TV shows and do some Christmas stuff. That’s what I want to do. If not this year, then maybe next year. We just want to get out and do stuff. Me and The Dap-Kings could get into doing music or something for movies. Or more commercials! Anything, we just want to keep it going! SPAZ: What are you currently spinning at home on your record or CD player? SHARON: Believe it or not, I’m going to be listening to our Christmas songs so I can get some of those songs in my head, so I don’t have to read them off of a sheet of paper! Special thanks to Steve Dixon, Nick Kominitsky, Mary Colimon and all at Daptone Records.